FRANK STELMACH In 1982, my son and I, along with four other friends, decided to go to Alaska for a once-in-a-lifetime fishing trip. We continued to go to Alaska every year with various groups of friends and acquaintances. In 1988, I purchased a camp for my personal use. Later that year my son decided to move to Alaska. In 1989, he and I decided to open a lodge that would cater to the common angler by setting a price that was affordable. The first year we took six fishermen a week, doubled that the second year, then to 18 and up from there. ASJ Tell us about the fishing at Island Point Lodge. FS We fish for all five species of Pacific salmon throughout the summer salmon runs. Kings begin to show in May and run to the end of July before spawning in August. Late June and into July the sockeye arrive. They are mostly a river fish as are pink salmon, which arrive in late July along with the chum. Some of the best salmon fishing is for coho, which arrive in early August and run into late September. We fish for halibut in 20 to 90 feet of water using 1-pound weights. Most other areas of Alaska like Ketchikan, Sitka and other areas will normally fish 200 to 500 feet with 5-pound weights. They do have some shallow areas as we do, but they find better action at the deeper waters. The reason we fish the shallow water is that Petersburg has several canneries that process a lot of fish with scraps going out as waste. The main reason we fish shallow is that after the salmon spawn, they die and float out the rivers into the bays to become food for the halibut and crabs, as well as the seals and sea lions. We have several varieties of rockfish, along with eels, octopus and crabs. The rivers also have cutthroat and Dolly Varden. ASJ What’s the dining experience like? FS We start serving breakfast at 5 a.m.; pop your head in the kitchen door, see what the daily breakfast is and place your order. You can make your own sandwiches for lunch with meat selections from our refrigerator or you can come back to the lodge and eat. If you caught a crab, a salmon or some other fish, we will prepare it for you. Dinner is at 7 p.m. and usually at 6:30 we’ll have hors d’oeuvres. One night a week we do a pig roast on an outside grill; we have a game burger night, deep-fried halibut, grilled salmon, baked or grilled halibut, baked chicken and a spaghetti night. ASJ Your website says you specialize in international guests. Can you share a story with some international visitors or any guests that’s memorable to you? FS Most of our guests are from the United States and Canada, but we have had guests from New Zealand, Australia, England, Ireland, Spain and Germany. Our oldest international guest was 92 years old from Germany. He fished one of our rivers, Kah Sheets. To get to the waterfalls and pool is a 2-mile hike uphill on a boardwalk. He caught his limit of sockeye and carried them down with him to the boat; pretty good for a 92-year-old guy. Our oldest American guest was 95, a doctor from Yakima, Wash. He loved fishing for kings, and on his last trip before he passed away he caught a large salmon; he was very proud and happy with the fish. ASJ What else is special about a stay at your lodge? FS Besides all the fish, the next best reason is that we are located in Southeast Alaska in the Tongass National Forest. The scenery is spectacular because of the glaciers, snow-covered mountains, the bays, cove and channels. You can see humpback whales and orcas; they come through the Wrangell Narrows directly in front of the lodge. Seals and sea lions, sea otters and deer are at the foot of our decks. It’s not unusual to see moose, black bears and wolves swimming across the bays and channels or walking the shorelines. Lots of bald eagles everywhere. 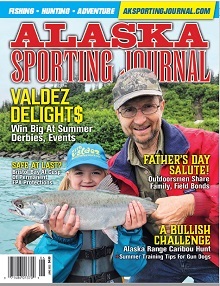 You get a great Alaskan experience when you come fishing in Alaska. Again, the attraction is fishing, but the experience is getting out there and enjoying nature.